Restoring of missing or damaged teeth is done with a variety of techniques, including crowns, veneers, bridges and dentures. 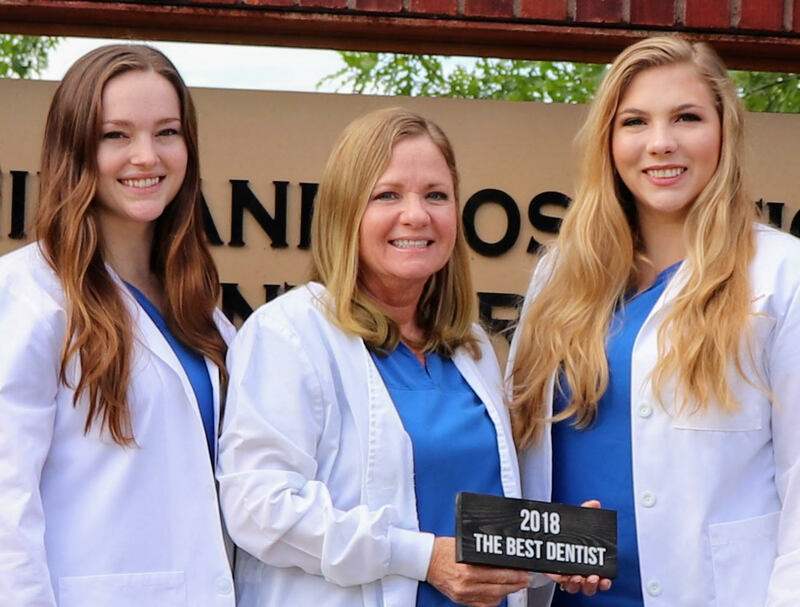 Kimberley A. Baker, DDS, Kelly A. Harrelson, DDS and Morgan E. Johnson, DMD specialize in beautifying smiles, maintaining your dental health, and helping you improve your appearance. We employ a patient-first philosophy to provide the services you need in the manner most beneficial to you. Our experienced and friendly staff takes great pride in keeping your smile beautiful. Our commitment to you is that the veneers, fillings, crowns, and bridges we create will look as good as or better than the teeth nature gave you. And to honor that commitment, the products we recommend and use are the highest quality and incredibly durable. You can trust your smile with us. Kelly A. Harrelson, DDS graduated from The University of Oklahoma College of Dentistry in Oklahoma City, Oklahoma. She received her Bachelor of Science in Biology from The University of Arkansas - Fort Smith. Dr. Harrelson is a member of the American Dental Association, the Texas Dental Association and the North Texas Dental Society. Originally from the small town of Bokoshe, OK (population 512), she now resides in Justin, TX. Morgan E. Johnson, DMD earned her degree from Case Western Reserve University School of Dental Medicine in Cleveland, Ohio. She received a Bachelor of Science in Microbiology from The University of Oklahoma. Dr. Johnson is a member of the American Dental Association, Texas Dental Association and the North Texas Dental Society. Originally from Oklahoma, Dr. Johnson now resides in Grapevine, TX. ""The hygienists are very gentle and Dr. Baker makes me laugh!"" "Dr. Baker one of the best dentists I have ever had... she has a great sense of humor and knows her stuff.."
"I LOVE getting my teeth cleaned! The ladies here rock ;)!" "From the moment I walk through the office door to the time I pay for my visit, my time at Dr. Baker's office is always great. The front office staff and the hygienists always call me by name and seem to genuinely care about their patients. I live in Denton but happily drive 20 miles just because Dr. Baker is the best!" Her office staff worked quickly to get my approvals additionally they were very kind and reassuring. The hygienist and dental assistants are the top-of-the-line people! I loved loved loved them! I definitely am terrified of the dentist no longer thanks to Dr. Baker!" "Very friendly staff who greet you with a smile upon entry. The hygienists are good & thorough. We will continue to visit this office." "Best dentist appointment I've ever had." "Great staff, friendly, no nonsense approach to common issues. Dr Kim Baker is FABULOUS!!!" "Everyone at this office has been amazing. So friendly and personable, I recommend Dr Baker and Dr Johnson. Has your dentist offered to loan you their headphones when you forget yours for a crown replacement? Mine has. Just the level of care and kindness from everyone is wonderful." "Been going to Dr. Baker for years. She's made me not fear going to the dentist. Staff have always pleasant and helpful." "My husband loves this place. He does not like dentists and they have taken very good care of him."